William Patrick Patterson is a leading exponent and teacher of The Fourth Way. He is in the direct lineage from Mr. Gurdjieff to Lord John Pentland, the remarkable man Gurdjieff appointed to lead the Work in America. 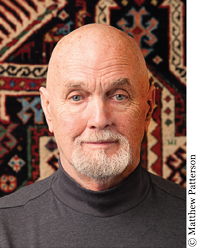 Mr. Patterson is the founder of The Gurdjieff Legacy Foundation, The Online Fourth Way School, and The Gurdjieff Journal (est. 1992), the first and only domestic and international Fourth Way journal. He leads study groups, gives seminars and has written nine books, as well as written-directed-narrated seven films on The Fourth Way. Events, books, films and The Gurdjieff Journal can be purchased at GurdjieffLegacy.Org.